Whether you're a mountain biker, a dog walker, a camper or simply love spending time in the great outdoors, trailing mud into your car, tent or caravan is never a happy end to the day. What's more, leaving dried-on dirt on your outdoor equipment doesn't do it any favours - it's much better to rinse it off as soon as possible. That's where the Kärcher Mobile Washer comes in - a simple and lightweight solution for cleaning on the go. 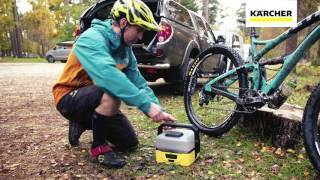 The Mobile Washer is easy to store in your car boot or caravan, with a 4 litre water tank and a 5 bar pressure that's perfect for rinsing off your bike, wellies, dog or pushchair at the end of a muddy day. When you're finished, the spray gun and hose stores away tidily, with extra accessory kits available for efficient aid thorough cleaning of bikes, pets and outdoor equipment. This machine comes with a 2 year warranty.